Prof. Brijendra Nath Goswamy is in Bangalore to deliver Tasveer Foundation’s inaugural lecture. I have been allowed to take him out for an hour. Where does one take a man who is arguably India’s foremost art historian? I consider a ride in our new Metro to Angadi Silks or Vimor to buy a sari for his wife. This is a man, after all, who invited three of the country’s top dancers—Bharatanatyam’s Malavika Sarukkai, Odissi’s Madhavi Mudgal, and Kathak’s Aditi Mangaldas—to perform at his wife’s 65th birthday. They agreed. I want a similar grand gesture when I turn 65, I tell my husband. He gives me a sceptical “are you worth it" look. Finally, I take Prof. Goswamy to The Taj West End, mainly because it is close to art collector Abhishek Poddar’s house, where he is staying; and because it has an “Art Corridor". 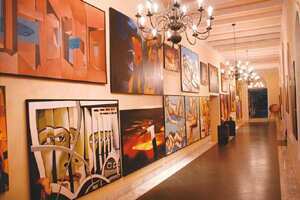 I take Prof. Goswamy on a walk through The Taj West End’s Art Corridor, where a number of contemporary paintings are displayed. I want to see art through his eyes and he obliges. He stands before a Shuvaprasanna owl drawing that he likes. “Shuvaprasanna sees something in birds that you and I don’t ordinarily see," he says. “There is something sinister and wise about this owl, and I like the fact that he hasn’t covered the entire painting with black and allowed some room for the painting to breathe." Thota Vaikuntam’s three paintings are dismissed with a “if you’ve seen one, you’ve seen them all. It’s too laboured; all surface." Before we know it, we have an audience which trails us. Prof. Goswamy’s distilled aesthetic comes from art acquisition trips across India with C. Sivaramamurti, the National Museum’s first director, whom he calls a “savant who knew art from the inside". In Cuttack, Prof. Goswamy was drawn to a painting in a private collection in which the Hindu god Krishna was carrying Mt Govardhan, except that the base of the mountain was shaped like a bow. Prof. Goswamy felt that the painter was connecting the Krishna avatar to the earlier Ram avatar. He talks about a verse in the Krishna Karnamrutham, in which Yashoda puts a baby Krishna to sleep by telling him the story of Ram. “When I saw Mt Govardhan painted like a bow, I felt that the artist too had made such a connection," says Prof. Goswamy . “It was like leaping across time and space to hear the whirring of the artist’s mind. It was extraordinary." Prof. Goswamy’s facility with Sanskrit verse, Urdu poetry and Indian philosophy allows him to make uncommon connections between the Natya Shastra, the mother lode of all Indian aesthetic traditions, and, say, English poetry. He says that Abhinavagupta, who interpreted the Natya Shastra, talks about a chamatkar or miraculous effect that will occur in the mind of a rasika when a work of art “whispers" in her mind. “It is as if magical flowers are blossoming in your imagination. We call it adbhut pushpaani," says Prof. Goswamy. As someone who loves abstract and contemporary art, I am a little rattled by Prof. Goswamy’s obvious love for ancient Indian art. What am I missing? Why can’t I enjoy miniature paintings or Chola bronzes as much as him? Why are today’s Indians so disconnected with our ancient artistic traditions? Two collectors—(Abhishek and Anupam) both sharing the last name, Poddar— have talked to me about how Prof. Goswamy has infused his love of ancient art in them. If he has managed to convert two of India’s top contemporary art collectors, who am I to fight his evangelism? I think of this as I stand before the beautifully curated artworks at the Grand Hyatt Mumbai. It juxtaposes ancient replicas with contemporary originals by marquee names—Jitish Kallat, Anju and Atul Dodiya, among others. But the contemporary pieces don’t appeal to me today. Instead, I am drawn to a beautiful Ardhanari bronze sculpture tucked away in a dark corner. I have seen such images countless times in temples. Their symmetrical limbs and serene faces are part of my subconscious. I take them for granted. Today, I observe the quiet figures of Nataraja and Ardhanari through new eyes. These bronze sculptures don’t surprise and jolt me, particularly when compared with the nearby Anju Dodiya installation. Contemporary Indian art can be stunning. When viewed through Prof. Goswamy’s eyes, it can also be shrill, emphatic, in-your-face, fighting for your attention amid a barrage of visual stimuli. Prof. Goswamy’s refined aesthetic belongs to a quieter pre-YouTube time but can be cultivated even today. He is drawn to lightness and subtlety. He loves Urdu poetry, he says, and eschews harshness of any kind, even in words. “People say they get gooseflesh when they see a work, but that sounds like a skin disease. Even the correct English word, horripilation, sounds horrible. We call it roma harsh, or the fine hairs on our body standing erect in happiness. How beautiful and poetic that sounds," he marvels. Rasa or aesthetics is a topic close to his heart. Later that evening, he talks about the Pahari painter Nainsukh to a Bangalore audience that includes Yasmeen Premji, Sarukkai, Britannia CEO Vinita Bali, sculptor Balan Nambiar, and India Foundation for the Arts director Anmol Vellani, among others. As I drop him back, I ask Prof. Goswamy who his ideal dinner companions would be. Nainsukh the painter, of course, he says. Urdu poet Faiz Ahmed Faiz, “because I could spend a day reciting Urdu poetry". Musician Kumar Gandharva. And William Shakespeare, “because I am passionately fond of his work". A scientist like Albert Einstein who “viewed light and space differently". And lastly, the maker of a Chola bronze because “I want to know how he thinks". Prof. Goswamy is not just an art historian. He is really a time traveller; someone who wants to leap through the centuries and into the minds of those anonymous artists who have created some of our country’s finest art. I envy his artistic sensibility. I think of him as I walk through the Chennai museum’s superb bronze gallery, containing rare Chola and Pallava bronze originals. Speak to me, I tell the Parvati image. What am I missing? Who created you? What am I looking for? I peer hard. A certain chamatkar happens. As I watch Parvati unblinkingly, she winks and gives me a Mona Lisa smile. I swear it. I was not tripping on anything. I was merely high on art and glorious magical flowers blossomed. Adbuth Pushpaani!